What better way to celebrate than with these gorgeous party favors that announce the forthcoming arrival? 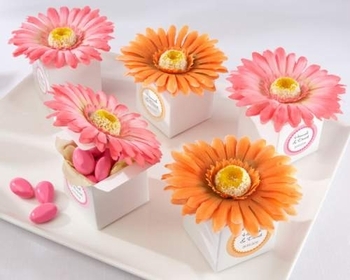 The white favor box comes with a single silk gerbera daisy with a yellow center and is available in bright orange and hot pink. It measures 2 inches square while the gerbera daisy is approximately 4 inches in diameter. The pop-up box makes assembly a breeze � you�ll be ready to party in no time! Minimum order is 48 (2 sets of 24) and optional personalized stickers are available. Please note that these favors usually ship in 3 � 4 business days unless personalized. Should personalization be requested, the favors will ship in 5�7 business days. Processing Time Non-Personalized: 3-4 business days.